Above: Various works by Amber Robles-Gordon. In a way, looking at the art market is akin to playing speculative archeology in reverse, where the best case scenario is to discover a work of immense value before it’s covered up (or is discovered by someone else.) However, some collectors also want to help artists’ personal growth and their audience’s ability to have better access to and appreciation of art. Mrs. Rosa de la Cruz, wife to Carlos de la Cruz, the chairman of $1 billion-per-year beverage empire based in South Florida. She also heads the 30,000 square foot de la Cruz Contemporary Artspace in Miami’s Design District and has sponsored the recently opened de la Cruz Gallery at Georgetown University. 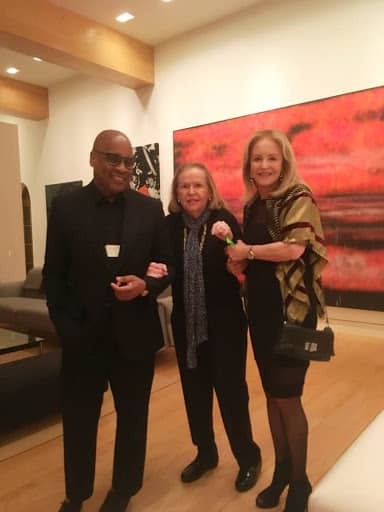 Mrs. Carole Guest, a former Wall Street executive and wife to Frederick Guest II, a venture capitalist and real estate developer who is also based in South Florida. Dr. Michael Butler, retired gastrointestinal surgeon and executive director of Griot Arts Gallery, a community-focused initiative located in the Center of Haitian Studies in Miami, FL. Mrs. Juanita Hardy, founder of the Millennium Arts Salon, a premier specialty marketing group. She and her husband, Mel Hardy, work with DC-based institutions to produce original programming focused Black artists, civic engagement and sponsorship of the arts. Ms. Charlotte Newman, who leads financial services public policy for Amazon Web Services and is a former senior advisor to Sen. Cory Booker. Dr. Darryl Atwell, anesthesiologist and sponsor of programming for several high-profile Black artists and writers at the National Gallery of Art. Creator and host of Kinetic, an artist lecture series at American University; also has an upcoming book review of curator Jeffreen Hayes’ show on Augusta Savage. Lyric Prince [LP]: When did you start collecting art, and why? Rosa de la Cruz [RC]: We [with her husband of 57 years, Carlos de la Cruz] started collecting around 35 years ago. At first, we were basically collecting Latin-American artists. Over time, we thought doing that was really discriminating, because other people were left out. So then, we decided that we wanted to open the [de la Cruz Collection] in Miami; now, it doesn’t matter where the artists come from. Above: Glenn Lignon, Rosa de la Cruz and, Carole Guest. Courtesy of the author. Carole Guest [CG]: [Rosa] allowed me to join her at one of the fairs with Shaun Regen from the Regen Projects- that’s where I first saw her relationship with artwork and what she thought about it. Then, I had to go back and [start my own research.] My education in art came very late because I didn’t really have the interest earlier. I was a single girl before I was married, and I needed to have a career [in Wall Street]. My husband [Frederick Guest] was already a collector of photography, which never really held a strong interest for me. 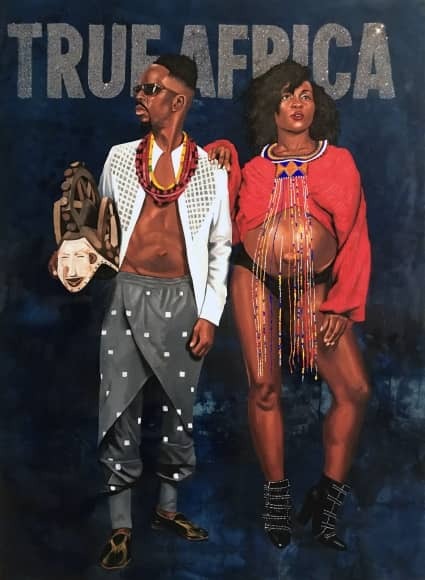 Charlotte Newman [CN]: Growing up in Atlanta, I was inspired by my godmother Tina Dunkley’s art and viewing exhibitions at the Hammonds House Museum. Those early influences would later fuel a passion for art at Wellesley College where I earned a B.A. in Art History…I bought my first piece of art as a college student, but I started seriously collecting in the last several years, which allows me to merge personal and professional interests. So, my collection features artists that explore socio-political issues through an artistic and cultural lens. Michael Butler [MB]: When I was going to college, Black studies was checkered off, and I wanted to learn [more]…I started getting the knowledge that would support the idea [of Black people] having a long, storied history of accomplishments that needed to be out there. That guided my study [into] African American culture, which laid the groundwork for ultimately collecting art…[but] the art thing started as a decorating project. When I got my first job as an attending, I wanted to fill my condo with things that reflected the way I saw the world, and how the world saw me. I wanted something of MLK, but I didn’t want a standard mountain-top looking kind of [artpiece.] And one thing lead to another. [LP]: How many pieces are in your collection? What medium do you like to collect the most? Juanita Hardy [JH]: Well, it’s hard to do a count because we have a lot. When I first started collecting art, it was paper. Now, we [with her husband Mel Hardy] mostly collect paper; some of it is framed and a lot of it is in our flat file. So I’ll say 200, because a lot of it is prints, etchings, and silkscreens. I continued to develop as a collector and to learn about the artists, and then as my financial ability grew, I started collecting canvas and some sculpture. I really love them all. In all of these years of collecting, we’ve never sold or traded a work. Darryl Atwell [DA]: 90 to 100, I guess. Not that I give out a ton of advice, but I tell people all the time- I look at everything from any genre, any artist, or any place. And I have an appreciation for it all. But when I’m buying or collecting, I’m specifically looking at works of persons from the diaspora; I choose to support that community because I’m from it. But I don’t have a specific kind of art that I like. Any kind of any medium, whether it’s painting, sculpture, or video art- I really appreciate it all. [CG]: Maybe 300 pieces, that’s photography [that my husband collects.] My passion is paint or the idea of painted work, such as silkscreens. I go across the spectrum, but a lot of it has to do with what you’re able to get. I’m not a huge collector by any means, so I’m not always able to get all the artists [I want]. So sometimes they’re gone, or they’re too expensive before I could get them- so I buy works on paper. [LP]: What sort of artists are you collecting? Anyone in particular, and why? JH: The early works of Sam Gilliam; paper [at first], then eventually we bought a large wooden piece by him. Elizabeth Catlett, on paper, but they’re early works; also, Lois Mailou-Jones, on paper, early works. Mailou-Jones was a professor at Howard University and spent her summers in Paris. Also, there’s Samella Lewis. We have one of the smaller paper pieces, but we also have an oil by her. Also, some of the more recent contemporary artists- such as Amber Robles-Gordon. I love Amber’s work and I love what she’s doing. We have around four or five pieces by her. 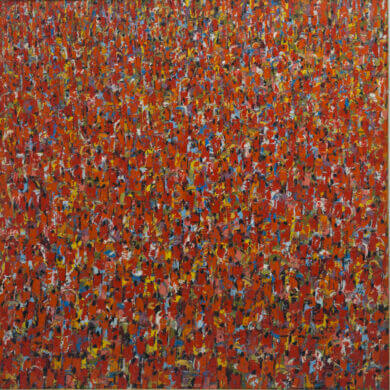 Stan Squirewell– we have several pieces by him. Vivian Brown, who was a New York painter. A gallery in New York just opened a retrospective of her work. Camille Billops- I just love her work. Also, E.J. Montgomery. Akili Ron Anderson. Bill Hudson, out of New York. Joe Overstreet, out of New York. John Scott, out of New Orleans. Charles Searles, out of New York; Kevin Cole, out of Atlanta. Herb Gentry, a dear friend. Al Loving. DA: Leonardo Drew, Kevin Beasley, Theaster Gates, Tony Lewis, Lynette Yiadom Boakye, Turiya Magadlela, Sam Gilliam. I’m hesitant about [naming names] just a little bit because sometimes when you read these articles you can get that “Who’s Who” kind of feeling about it, especially in terms of the notables. I have some of those personally, like Mickalene Thomas, Wangechi Mutu… so, it’s hard for me to name artists that are my favorites. I love them for different reasons. I have some more obscure artists, like a guy named Harold Mendez- well, who’s becoming less obscure- but I really think he’s a fantastic artist. There are some artists that are just excellent painters, like a guy named Tajh Rust, that I collected recently; he paints figurative work. But then someone like Kevin Beasley, who to me is doing something so disruptive, different or new- that’s actually what I like the most. CN: Pamela Phatsimo Sunstrum, while from Botswana, lives between South Africa and Toronto. Her work is really interesting; she’s exploring a range of themes from timelessness to placelessness, devoid of the vestiges and baggage of colonialism, racism, sexism, etc. 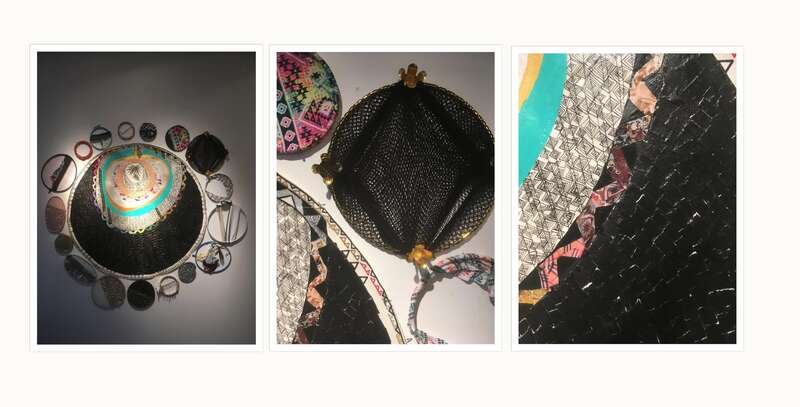 I also really enjoy collecting pieces made with non-traditional elements, like embroidery or hosiery. Turiya Magadlela? I have a piece of hers. Hosiery is such a perfect medium to use to explore gender inequality, given the social and cultural connotations associated with it. Viewing her work made me think of growing up in the South and being required to wear hosiery to church. I’ve also collected a South African multi-disciplinary artist Kimathi Mafafo. The piece in my collection depicts a woman with traditional cloth cloaking her mouth, referencing how cultural expectations can silence women. [LP]: What direction do you want to take your collection, going forward? CN: That’s a really interesting question. More abstract work, for sure. Also, I’ve primarily collected women of color. Supporting black women who create work that resonates with me was a core part of my early collecting thesis. However, I’m now looking at a broader range of artists and weighing how to remain true to a passion for supporting Black female artists alongside other evolving interests. I’ve fallen in love with the art and culture of Colombia and Mexico through extensive travel to those countries and others throughout Latin America, and I look forward to adding pieces from that region. DA: The direction would be, again, just to continue to expand this idea about what artists can do. I continue to look for artists that are pushing these kinds of boundaries. I want the art to challenge people- not that it’s like a game or anything- but I think sometimes, with the history of art, it’s hard to do something new. [In regards to emerging artists,] I think some of them are so new and I think the danger- the way the art world is going right now – is exposure and how artists are thrust into the spotlight. People think because a piece of artwork sells for $30- 40,000.00 right now, means something, right? It means nothing. It’s a blip in the art continuum. Some of these artists, you know, haven’t completed an MFA yet. I think it would serve them better to let them continue their process first before they’re out in that space. 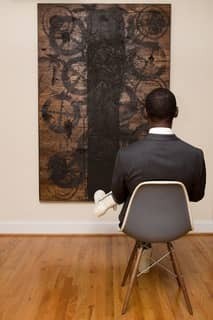 Above: Darryl Atwell sitting in front of Good Vibrations, 2013, Rashid Johnson, courtesy Darryl Atwell. Photo Credit: Kevin Broome. [LP]: What sort of lasting impact do you want your collection/interest in art to have? RC: We have a great education program where we send, every summer, the whole graduating class of the New York School of Visual Arts to Europe. Also, we send 40 younger students from Miami, chosen by the teachers and along with the teachers, to study in NY during the summer. And you cannot imagine how important that is, because the kids that live in Miami are not exposed to this; they live in an island. The teachers that go with them to NY, they also become more exposed. We have this [travel] program because when students write down [on their resume] that they spend the summer in NY or Europe, it brings their status up. We also give them suitcases, sheets, and towels, because I want them to get to NY and not feel embarrassed; because imagine, if you come from a [poorer] family in Miami, and you need to take sheets and towels [on a trip,] they’ll probably give you some leftovers, or something that belonged to your grandmother. I want the students to look and be happy when they get to NY-to be the same as the others. MB: Dr. Larry Pierre, director of the Center for Haitian Studies, would come to visit my medical office in Jackson, and he would see the art on my walls. We got to talking about and looking at it. After I retired from Jackson, he said, ”If you are willing to share your art with the public, I’ll give you the space to do that.” You can’t lead people to a place that they can’t see…In order to change circumstances, you have to start with changing minds. Overall, each collector chose art that moved them, where they saw a personal connection with the subject matter or the story of the artists themselves. The act of collecting doesn’t just involve a collection’s size; the most dedicated collectors are motivated to acquire and share their art with the larger world.